Tofield is an unusual surname. Most of the Tofields in the world can trace their lines back to either the Yorkshire Tofields originally from Doncaster, or the Buckinghamshire Tofields originally from Stewkley. There is a town near Edmonton in Alberta, Canada called Tofield which is named after a Dr J.H. Tofield who settled there in 1893 from the Yorkshire line. In both places the family seems to have been landowners but the link, if any, is unknown. In Buckinghamshire the Tofield surname has evolved over the centuries and probably derives from the Norman de Tocqueville. In mediaeval records it appears as Tokeville and then Tokefield, then Tockfield and then it becomes Tofield. There was a large Tokeville-Tokefield-Tofield family living in the Chesham area in mediaeval times through to the 1800s. In the 19th century the surname is spelt variously Toefield, Toffield, Tofields and Tofield. Today it is always spelt Tofield. The North Bucks Tofield family originate from Stewkley where the first recorded reference is in 1649. Over the centuries they were almost always farmers or connected to farming. The first mentions of Tofields in Swanbourne are when Benjamin Tofield of Stewkley married Fanny Doe of Swanbourne in 1789, and then William Tofield of Stewkley married Elizabeth North of Swanbourne in 1821. The Swanbourne Tofields descend from George Tofield who married Mary Kibble in Stewkley in 1820 and they had 11 children. Their oldest child was Edward Kibble Tofield (1820-1888) who had a son Edward Tofield (1844-1931), and the youngest son was George Tofield (1840-1920) who was only four years older than his nephew Edward. Edward Tofield Junior married Sarah Dimmock (1848-1902) in 1867 and his uncle George Tofield married his cousin Mary Kibble in 1862. Edward and Sarah Tofield never had any children but George and Mary Tofield had a daughter Jane Maud Tofield (1864-1932) and a son Robert Tofield (1866-1922). In 1872 Mary Tofield died in a tragic shop fire in Stewkley. After that Edward and Sarah Tofield and his uncle George Tofield took a farm at Great Horwood, where they are living in the 1881 census. 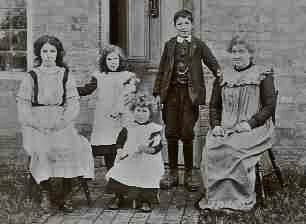 In the 1880s they moved to Briar’s Bank Farm in Great Horwood, where they are living in the 1891 and 1901 census returns. Jane Tofield married Albert Dunkley (1865-1948) and they moved to Hampstead. Sarah Tofield’s youngest sister Elizabeth Dimmock (1866-1937), came to live with the family in 1892 and she married her brother-in-law Robert Tofield at Great Horwood in 1894. 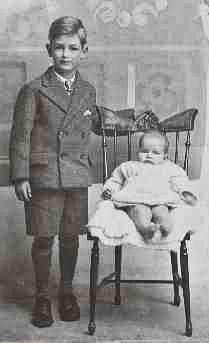 Robert and Elizabeth Tofield had four children born at Briar’s Bank Farm: Robert Tofield (1895-1990), Mary Jane Tofield (1897-1987), Fred Tofield (1901-1991) and Amy May Tofield (1906-1997). They were all christened at Great Horwood Church. Sarah Tofield, wife of Edward Tofield died in 1902 aged 55 and was buried in the churchyard at Great Horwood. The Tofield family of Nearton End. From the left, Mary, Amy May, Violet, Fred and their mother Elizabeth. About 1907 Robert Tofield, took Nearton End Farm at Swanbourne, bringing with him his family which included his father George (known as Grampy) Tofield and his cousin who was also his brother-in-law Edward (known as “Uncle Ned”) Tofield. George Tofield died and was buried at Swanbourne in 1920 aged 80. Uncle Ned died in 1932 aged 87 and was buried with his wife at Great Horwood. In 1910 Robert and Elizabeth Tofield’s daughter Violet Elsie (Vi) was the first Tofield born at Swanbourne, and she was christened at St Swithun’s. The family were originally Anglican, but they sent the children along to the nearby Primitive Methodist Chapel in Nearton End, and over time the family became stalwarts of the chapel. Through the chapel and farming connections the Tofields became friendly with Rees Rees and James James the Welsh drovers from Padbury, and the Tofields were also related to the Kibble family at Buxlow Farm, in Swanbourne. After Robert Tofield Senior died in 1922, his son Robert (Bob) Tofield Junior continued to farm Nearton End Farm. In 1923 Bob Tofield married his cousin Violet Maud (Vi) Dunkley (1892-1975) at Hampstead. In 1931 her mother Jane Dunkley died whilst visiting Swanbourne, and was buried at Swanbourne cemetery next to her brother Robert. Fred Tofield married Clara Faulkner (1904-1970) of Stewkley and they farmed Thatcham Ponds Farm near Silverstone, and then at Manor Farm, Rowsham near Aylesbury. Mary Tofield married her second cousin George Tofield (1897-1980) and they lived and died at Newton Longville. May Tofield married Ernest William Frank Gurnett and her sister Violet married his cousin William Alfred (Bill) Gurnett. The Gurnetts stayed in Swanbourne and were stalwarts of the Methodist chapel. In the 1980s Fred Tofield retired, living in Nearton End where he shared house with his sister May Gurnett, until he died in 1991. They were then living opposite the farm where they’d grown up. The family still live locally, and some are still connected to the chapel. See related pages on the Gurnett Family and Rees Rees the Welsh Drover.